She was a star of the quays behind the famous Croisette in Cannes during the last Festival de la Plaisance where she debuted officially, challenging the seasoned rank of flying bridge superyachts that flocked to the French event. We're talking about the Ferretti 881 which, 27 metres long, has become the new flagship of the Ferretti Yachts brand. 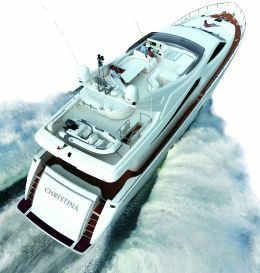 In a now tried and tested tradition, the boat is a result of teamwork within a partnership that always lives up to its fame: on the one hand Studio Zuccon International Project for overall design, interior layout and décor, and on the other the Ferretti Group Engineering Division for the hull. As with all new hulls built by the Ferretti Group, avant-garde design systems were employed: computer designed waterlines, but also computer analysis of how the boat will actually behave under way, and the construction of models and moulds of micrometric precision. It's clear at first glance that the 881 is a Ferretti. This powerful brand identification is the work of Zuccon which has been guiding the Forlì yard's design evolution for years. Apart from the position of the roll-bar above the flying bridge - in the standard version of the Ferretti 881 it's oriented aft - there are many similarities with the 830, the other Ferretti superyacht, but also with other smaller models in the range. They share not only a style but also a design philosophy featuring, for example, the famous open-views, great side windows. 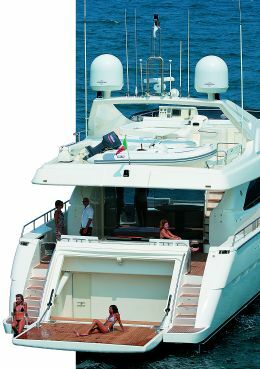 As well as being a distinctive sign of the aesthetics of much of the range (they are found on the biggest Ferretti motoryachts, starting with the 630, except for the 681 and the very recent Altura 690) they give considerable light and are unusually evocative and eye-catching when you are aboard. 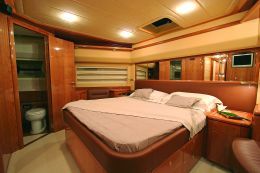 Also on the Ferretti 881 the open-views correspond to the owner's cabin, full beam, which is roughly amidships on the lower deck. It's actually more of a suite than a cabin: double bed, spacious wardrobe, dressing table flanked by an L-shaped sofa and, beneath the window, a bench that can be fully stowed away. It is spacious in itself, but so much natural light gives the visitor the impression that it is even bigger and decidedly enjoyable. 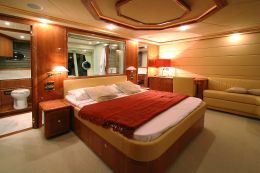 So even from his bed, positioned athwartship, the owner can enjoy a panoramic view outside and the spectacle of the sea. The same view can be seen from the en suite bathroom which is in a double-access area along the starboard bulkhead. The floor is in open pore teak with marble inserts. There's a Jacuzzi and a spacious shower unit with sliding door. The guest cabins too are on the lower deck. 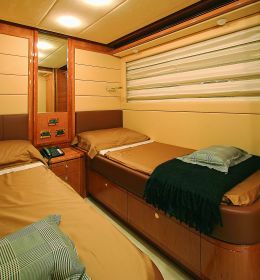 There are two twin bed cabins at the sides of the central access corridor and a VIP cabin fully forward. Though smaller, the latter's furnishings and attention to detail are on a par with the owner's standards. Obviously each cabin has its private bathroom, but also plenty wardrobe space. The crew's quarters are in two cabins forward of the engine room, both with bathroom and wardrobes. The adjacent galley is complete with a service dinette and facing seats. The external areas of the main deck are very attractive. The cockpit features a large round dining table, an ice-box and two sofas set against the spoiler. It is also well protected overhead by the flying bridge which extends to the stern. The area is well connected with the aft bridge by two flights of stairs at the side of the garage which can house a jet ski and, with hydraulic opening, be transformed into a spacious "beach", handy for taking a swim. It is also linked to the big sundeck forward by means of suitably sized gangways. 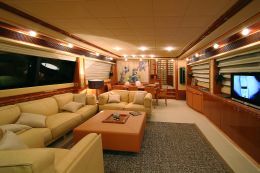 The interior spaces are well exploited with, on the port side, a comfortable living area with Frau sofas and armchair, opposite which there is a long sideboard which houses a large, fully retractable plasma TV. Farther along, still on the port side, is the dining are with a table seating eight. Then, at a slightly higher level, the fully equipped galley which communicates with the external gangway. On the starboard side there is a handy daytime bathroom. 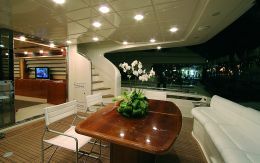 The indoor bridge completes the layout of the deck, well integrated into the luxurious context of the Ferretti 881, but also equipped with exhaustive instrumentation. One of the chief features of this new flagship's bridge is the control panel for the Anti Rolling Gyro system (ARG), an exclusive gyroscopic stabilising system that Mitsubishi created for Ferretti which guarantees more than 50% reduction of roll both under way and at anchor. 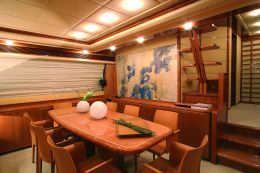 Starboard of the bridge the space has been furnished with a L-shaped dinette and serving table. The flying bridge too offers great space to enjoy, in spite of the fact that both the tender and a jet ski are housed aft. 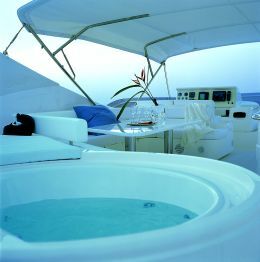 The designer developed it in such a way as to include a Jacuzzi, a sundeck, a "peninsula" bar with fridge and grill, and sofas and chairs at both sides. On request the vessel can be equipped with a hardtop that protects most of the flying bridge, but in this case the roll-bar is oriented as on the Ferretti 830, which is to say opposite to the direction of movement. As for performance, the new Ferretti 881 has 2x2.030 HP MTU engines, providing a cruising speed of 27 knots and a maximum declared speed of 31 knots.